The following information explains how to build basic triads and 7th chords ONLY. This will provide an excellent foundation for more advanced chords. See what others say about this free information. It is not necessary to memorize hundreds of chords. All you need to do is to learn the formula for making each chord type, and create the chord needed using the appropriate formula. This saves brain power from being wasted on unnecessary effort. It also allows gives you the true understanding of chord-construction, so if you later want to modify the chord, (make inversions) you will know what you are doing. You Don’t Need to Know All Your Scales! The way chords are usually taught are by first introducing scales. It is typically explained that a minor chord will use the 1, b3 (“flat 3rd”) and 5. (This terminology refers to the 1st, 3rd, and 5th “degree” of the scale.) A diminished chord will use the 1, b3 and b5. The reason this method is so slow to learn and to apply is that the person must first be fluent in all twelve major and minor scales! It’s not that this is bad, it’s just that it is NOT NECESSARY in order to play chords! Steps make thirds and thirds make chords. Before you can understand chords, you should first understand thirds. The half step is the interval we will use to make thirds. Half steps are the smallest distance between any two notes. When you play all the half steps it is called the “chromatic scale.” It doesn’t matter if the notes are black or white. For example, the distance between C and C# is a half step. E to F is also a half step. Practice making minor and major thirds on the keyboard. Select any note at random and then count three half steps higher to make a minor third and four half steps higher to make a major third. Practice making 12 minor thirds and 12 major thirds, starting on each note of the chromatic scale. This drill may take between one day and several weeks to master before you feel comfortable. Do not go on until you feel comfortable at making major and minor thirds. In fact, each of the following steps is built on the previous. Try to master each step before going on. Now you are ready to learn about how chords are made. When you stack thirds together, a chord is created. The chords are always built from left to right on the keyboard. The name of the chord is based on the first note of the chord which is called the “root.” A chord is technically defined as 3 or more notes arranged by thirds. A triad is a chord with only three notes. Then do the same on C#, and continue to C, one octave higher. Then descend. Identify the chords which start on the black notes by their sharp names going up and by their flat names going down. This will help you recognize them either way and become familiar with them. Soon, you may notice a pattern of changes as you go from one chord to the next. For example, from major to minor, the middle note of the chord moves down by half step. The reason we return to the Major chord at the end of each cycle is so that it is easier to go to the next key. After you have become familiar with basic triads, you are ready to actually play the chords as they occur in songs. 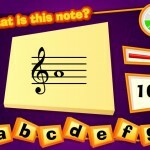 Get a songbook or a “fake book” and notice above the musical notation are chord symbols. Start playing these chords by their symbols as they occur in the music. If some of the chords in the music have more advanced symbols like “7” or “9,” for now, just delete this part of the symbol and play the elements that you currently know how to build. For example, if the chord symbol says Cm9, just play C minor. Sometimes, chords sound better when you play the notes of the chord in a different order than the order in which they were created. The original order is called “root position” (For example: a C chord contains the individual notes, C-E-G.) If you take the lowest note (C) and place it one octave higher, you end up with “first inversion” (E-G-C.) If you take the new lowest note (E) and place it one octave higher, you end up with “second inversion” (G-C-E). Practice your chords with our FREE Random Chord Generator.